We all love the warm, carefree days of summer, when the weather permits us to gather around the pool by day and the fire pit or chiminea by night. But the cold truth is, it's hot out there! 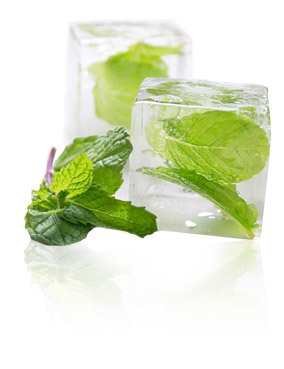 But while solar radiation causes the mercury to rise, we can turn to frosty foods and beverages to help cool us down. Whether your frozen fancy runs toward creamy ice creams, chilled soups, fruity ice pops or refreshing iced teas, we've got you covered with recipes that bring together the best of summer fruits and vegetables with flavorful herbs and spices. You may have noticed that last month was National Ice Cream Month, not to mention there also passed a National Ice Cream Day which falls annually on the third Sunday in July. These holiday claims make ice cream seem to be a very American notion—but the history of “iced cream” is actually a global affair. In fact it may have begun as early as 3000 BC in China with the advent of crushed ice from the mountaintops flavored with fruits and honey. Additionally, Marco Polo is credited with introducing this icy indulgence upon his return to Italy in the 17th century. From there, the recipe evolved to include milk and cream and spread throughout Europe, eventually making its way to the New World. In the U.S., the earliest ice creams were dubbed Philadelphia-style and, in contrast to European ice creams, were eggless and uncooked. The name not only signified a high degree of quality because it bears the name of the nation’s first government seat, but the City of Brotherly Love was also considered the National Capital of Ice Cream because it was served each Thursday at presidential dinners. From George Washington and Dolley Madison to Ginger Rogers and Snoop Dog, Americans have consistently demonstrated a soft spot for ice cream ever since. In fact, more than 1.5 billion gallons of ice cream are sold in the U.S. each year, making ice cream America’s hottest cool treat. America’s favorite ice cream flavor? Move over Rocky Road and Chocolate Chip Mint; it’s vanilla. In 1905, 11-year old California native Frank Epperson was visiting friends in New Jersey when he unintentionally left a glass of lemonade with a stirring stick on a windowsill overnight. In the morning, he found the contents of the glass frozen, which he freed by running hot water over it. What remained was the first known frozen treat on a stick. Seventeen years later, Frank, now married with children, introduced his "Eppsicle" at a fireman's ball in Oakland, California, and it was a big hit. A year later he patented and began marketing his creation, although at his children's insistence he called it "Popsicle," a word that combined "Pop's" and "icicle." Today, Unilever's Good Humor division owns the patent, and produces more than 30 varieties of the original "frozen juice" on a stick. Still, even after all these years, and no matter what brand these frosty treats are marketed under, the name "Popsicle" remains frozen in our minds and on our lips. 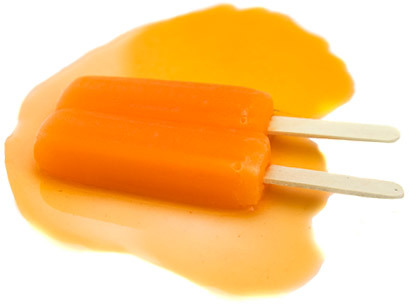 Forward Frozen Thinking: The double-stick Popsicle, which debuted during the height of the Great Depression in the 1930s, allowed two children to share the treat for the same price as a single-stick ice pop. Cold soups are enjoyed year-round in various regions throughout the world—and not all of them are in hot, tropical climates. In fact, serving cold fruit-based soup as a first course or dessert is traditional in Scandinavian countries. Russia is known for its colorful chilled beet borsch and Spain for its tomato-based gazpacho. In 1917, the chef of the New York Ritz-Carleton introduced the world to the chilled version of his mother's recipe for creamed leek and potato soup, which he called Vichyssiose. Curiously, the first recipe for gazpacho to appear in print in the U.S. was published in the 1824 cookbook The Virginia Housewife by Mrs. Mary Randolph. It’s unlikely that Mary, a descendant of Pocahontas and a cousin to Thomas Jefferson, could have had first-hand knowledge of this traditional Spanish dish, but it is speculated that her sister, who once lived in the southwestern Spanish city of Cadiz, may have provided the inspiration for it. In any case, with eclectic recipes like this soup-served-cold, Mary's influence on 19th century American cookery was profound. But her notoriety doesn't end there — hers is the oldest grave known to exist at what is now the Arlington National Cemetery. Tea drinking originated in China more than 5,000 years ago, but drinking tea over ice is a tradition born of South Carolina in the 18th century, the only American colony at that time to cultivate tea plants for commercial use. In contrast to chilled black tea with lemon that most of us recognize as iced tea today, the beverage was predominately made with green tea. It was also typically served as punch, which means it was often loaded with booze. One popular "tea punch" was Regent's Punch, named in honor of George IV, the rebellious British prince who became regent for his father, the king, in 1811. Judging from the ingredients, the beverage was just as spirited as George. In a recipe published in the 1887 Bartenders Guide, a mere three cups of green tea is combined with a full bottle of champagne, as well as a pint each of curacao liquor, rum and brandy. A few cups of this and it's "goodnight, Irene." Eventually, tea punch gave way to the individually-portioned cocktail and sweet tea reigned in the south as the beverage of choice based on its own merit. Today, many families take great personal pride in their recipes for iced tea, also affectionately known as "southern table wine," that have been handed down for generations. Follow Monterey Bay Spice Company's board [ beat the heat ] on Pinterest.